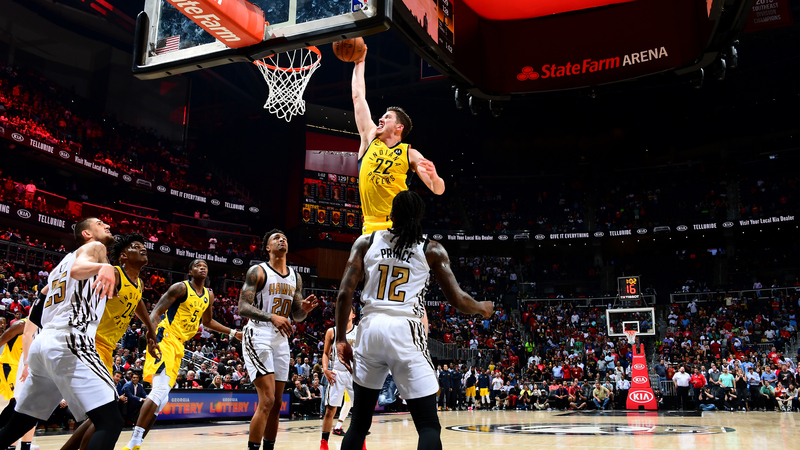 TJ Leaf had 28 points and 10 rebounds in Indiana's 135-134 win in Atlanta. 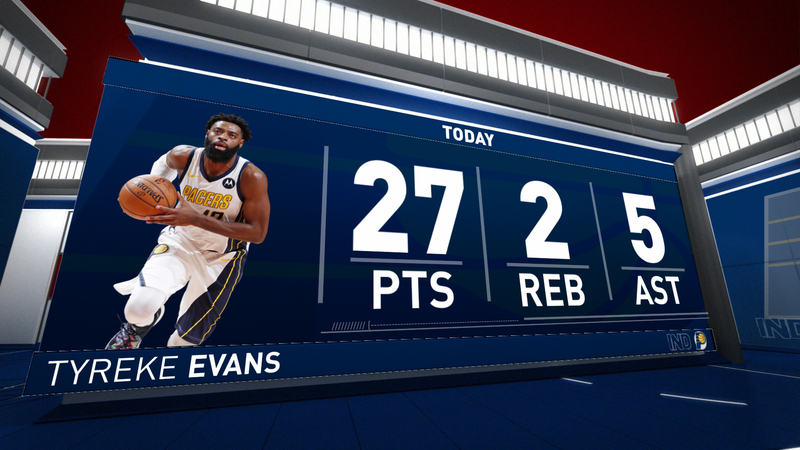 Tyreke Evans had 27 points on 9-of-14 shooting (5-of-8 from 3-point range) in the Pacers' 135-134 win in Atlanta. April 10, 2019: TJ Leaf picks off the pass and patiently drives to the rim for the layup. April 10, 2019: Edmond Sumner confidently takes and makes the corner 3-pointer. April 10, 2019: TJ Leaf gets the deflection to cause a turnover and runs the floor for the slick finish. April 10, 2019: Edmond Sumner makes the difficult catch and puts in the layup in the same motion. April 10, 2019: Tyreke Evans shakes the defender with the stepback and drains the 3-pointer. April 10, 2019: Darren Collison chases down the loose ball just before it goes out of bounds, and Alize Johnson gets his own rebound to finish off the play. It may not have mattered for playoff seeding, but tonight's regular season finale was still electric, as Edmond Sumner provided last second heroics to give the Pacers a 135-134 win over the Hawks in Atlanta. Trailing 131-130, Sumner made a jump shot to put Indiana back in front, 132-131 with 36.2 seconds to play. The teams traded misses on their next possessions, giving Atlanta the ball with 3.6 seconds left. Taurean Prince drilled a 3-pointer with 1.1 remaining, just enough time for one more shot from Indiana. On a 3-point attempt from the corner Sumner was fouled before the clock expired. Sumner stepped up to the free-throw line and nailed all three, giving the Pacers win No. 48 on the season. 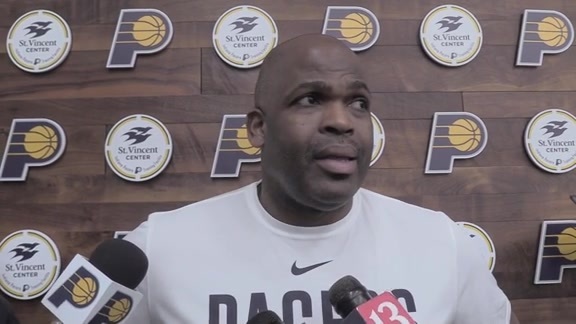 “He was very aggressive, and he hit big free throws," Pacers head coach Nate McMillan said. "It reminded me of the NCAA game, where we get fouled and then you have to step up and make three, and all three were solid." It was a much different looking Pacers squad tonight, as Darren Collison was the only regular starter in the starting lineup. But even with some of the team getting some extra rest before the playoffs, the Blue & Gold played hard all night. Behind 10 early points from Tyreke Evans, Indiana led 14-12 at the 6:50 mark of the opening quarter. After the game was tied at 21, the Pacers put together an 11-3 run to lead 32-24 with 1:45 to go in the first. Heading into the second, the Pacers led by seven, 35-28. By the 7:54 mark in the second quarter, the visitors had a double-digit lead, 52-42. Indiana continued to lead by 10, 58-48, but then Atlanta ran off 10 straight to tie the game with 4:38 left in the first half. The final minutes of the second quarter were a back-and-forth affair, with the Pacers ahead by just four, 73-69, heading into the locker room. In the third, Indiana was able to hold off multiple advances from Atlanta. After the Pacers' seven-point lead was cut to three at the 3:20 mark, Indiana outscored Atlanta 11-8 to take a 109-103 lead into the final quarter. The Pacers led by 10 early in the fourth, but with 5:41 to play, the advantage was just two, 121-119. But fortunately Indiana made just a few more plays than Atlanta to pull out the win in the end. Indiana was led by 28 points and 10 rebounds from T.J. Leaf. Evans scored 27 and Sumner finished with 22 points. For Atlanta, Trae Young and Prince each scored 23 points. John Collins had a big night, finishing with 20 points and 25 rebounds. The Pacers' 73 points in the first half were a season high. Cory Joseph played in all 82 games for the second season in a row. T.J. Leaf had a huge night. His 28 points and 10 rebounds were both career highs, and it was his first career double-double. The Pacers have now won five straight against Atlanta and swept this season's series. Myles Turner ends the season as the NBA's blocks leader. It's his first time leading the league in that category. Tonight was the Pacers' 48th win, matching last season's total. The Pacers start the postseason against the Celtics in Boston. Date and time forthcoming. Jack's Donuts: Visit your local Jack's Donuts the day after a Pacers victory and mention the Pacers win to receive a free twelve ounce coffee with any purchase. Visit JacksDonuts.com to find the Jack's Donuts nearest you.